Odd but true: in a summer jam-packed with sequels, a flick about decades-old toys seemed original. Such was the marketplace that greeted Transformers. When it hit the screens in early July 2007, viewers were burned out by the multitude of sequels, and I think that helped Transformers to its $315 million gross. Some very cool trailers contributed as well and allowed the flick to look like a must-see. At least until you actually saw it. I was excited to see Transformers on the big screen and actually forced my 72-year-old dad to go as well. I was in Arizona to visit when it debuted and wanted to be there opening night. The Old Man was less than enthused but put up with it to be a good host. I’d love to say the same about Transformers, but my Mama taught me not to lie. Quite possibly the biggest disappointment of the summer 2007 movie roster, the film not only didn’t live up to pre-release hype, but also it barely kept my attention for its 140 or so minutes. 1) Shia LaBeouf. 2007 has become his breakout year. First Disturbia became a nice little sleeper hit and then he got the lead in this flick. LaBeouf has real talent, and he brings great aplomb to his scenes – especially the comedic ones. He turns some otherwise insipid bits into amusing moments. I even sort of buy him in the movie’s action hero moments. LaBeouf has always been good and he continues to delight. 3) The visual effects. 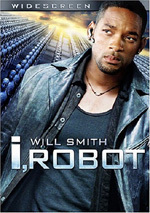 Since so many of its characters – ie, all the robots – are computer generated, these elements become especially important. Transformers pulls them off well. For years, I’ve muttered the refrain that I don’t like CG, but as the technology improves, I find myself less able to criticize those visuals and maintain credibility. Transformers features absolutely excellent CG visuals at all times. 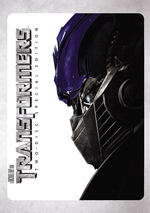 Transformers appears in an aspect ratio of approximately 2.35:1 on this single-sided, double-layered DVD; the image has been enhanced for 16X9 televisions. The flick received the kind of stellar transfer one would expect to come for a brand-new big budget effort like this. Sharpness seemed strong. 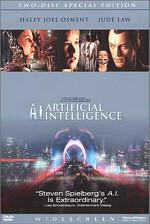 Despite a smidgen of edge enhancement, the movie looked concise and detailed at all times. No issues with softness materialized in this tight presentation. Jagged edges and shimmering created no distractions, and source flaws remained absent from start to finish. Since Michael Bay directed Transformers, it came with a stylized set of colors. A golden tint dominated much of the film and alternated with a bluish tone. Within those parameters, the hues seemed clear and dynamic. Blacks were dark and dense, while shadows showed nice definition and delineation. This was a very high-quality presentation. When you dropped big bucks for your home theater, you did so for soundtracks like the Dolby Digital 5.1 audio of Transformers. While I wouldn’t call it the best mix I’ve ever heard, it definitely delivered all the auditory goods I expected. A full-on assault from start to finish, the soundfield created a terrific sense of place. The various battle scenes – of which the film included many – used all five speakers to great advantage. Military elements and the Transformers themselves popped up all around the room to flesh things out in a dynamic manner. This was a consistently vivid, involving track. Music got a little buried in the mix, but the score was more than competent. It showed nice vivacity and dimensionality through the flick. Speech was natural and concise, as the lines lacked any edginess or other problems. This was a killer soundtrack. This two-disc set offers a nice collection of extras. Only one appears on the first platter: an audio commentary with director Michael Bay. He provides a running, screen-specific Bay. At the start, Bay tells us how he came onto the project. From there we learn about “Transformers School”, cast and performances, working with the US military, sets and locations, character design and effects, dealing with fan reactions, stunts and action, music and audio, and various publicity pressures. Say what you want about Bay, but he’s an interesting conversationalist. Sure, he comes across as rather full of himself, but he’s also honest about his work and various events. He makes sure we learn a lot about the movie and enjoy ourselves along the way; he’s not exactly a shrinking violet. Though we get more dead spots than I’d prefer, Bay provides a consistently informative and interesting commentary. Someone needs to tell him it’s not called “Industrial Lights and Magic”, though. DVD One also includes some Previews, though they’re semi-hidden. If you let the movie run to the end, you’ll get the option to watch a few clips. One – “Rise of the Autobots” – is actually an odd little 69-second music video of sorts and a waste of time. However, we do get the teaser for Transformers - which is the same as the one on DVD Two – and a promo for Iron Man with Robert Downey Jr.
Over on DVD Two, the extras split into three areas. Our World offers four featurettes. The Story Sparks runs eight minutes, 34 seconds as it mixes movie clips, behind the scenes pieces, and interviews. We hear from Bay, executive producers Steven Spielberg and Brian Goldner, writers Alex Kurtzman and Robert Orci, Hasbro Director of Boys Design Aaron Archer, producer Lorenzo di Bonaventura, and actors Shia LaBeouf, Jon Voight, and Josh Duhamel. We start with how the toy turned into a movie before we move to story and script development, Bay’s arrival on the project and his impact, conceptual and character design, and how Bay works on the set. The first half of “Sparks” works best, as it focuses on the project’s development. The second half is less useful; it digs into Bay in a superficial way and says little more than “he’s tough but a good director”. Despite some of the sketchiness of that part, “Sparks” offers a lot of good material. For the 13-minute and 11-second Human Allies, we get notes from Bay, di Bonaventura, LaBeouf, Bates, Duhamel, Voight, casting directors Janet Hirshenson and Michelle Lewitt, Holloman Airbase Commander Col. David Moore, and actors Megan Fox, Tyrese Gibson, John Turturro, Anthony Anderson, and Rachael Taylor. “Allies” covers cast, performances and training. Those notes are fine, as are some of the anecdotes from the set. However, the best parts of “Allies” come the behind the scenes bits. We see a few deleted scenes, some improv outtakes, cool shots from the set and a couple auditions. These moments help make “Allies” a solid program. Next comes I Fight Giant Robots. This 13-minute and 59-second show features Bay, Duhamel, Bates, Moore, LaBeouf, Army and DOD liaison Ltc. Paul Sinor, military advisor Harry Humphries, Air Force project officer Capt. Christian Hodge, producer Ian Bryce and actor Amaury Nolasco. This show examines military elements such as actor training, attempts to maintain realism, shooting battle sequences and some stunts. The focus on military elements makes “Fight” somewhat one-note, but it covers its subject well. I like the training footage, and the shots of LeBeouf as he deals with a hairy stunt are cool – especially when he gripes about a “fruity” line. “Our World” finishes with the 13-minute and 36-second Battleground. The show includes statements from Bay, di Bonaventura, Bryce, Humphries, Nolasco, LaBeouf, Anderson, Taylor, key location manager Ilt Jones, assistant location manager Perri Fichtner, executive producer Mark Vahradian, art director Beau Frutiger, second company grip Michael T. Travers, and set decorator Larry Dias. We check out the movie’s various locations and sets and related complications. Once again we learn some nice details about the production in this tight little piece. Called Their War, the next section throws out another for featurettes. 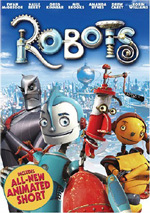 Rise of the Robots lasts 13 minutes, 41 seconds and provides notes from Bay, Spielberg, Archer, Orci, Kurtzman, Goldner, LaBeouf, Fox, Duhamel, Gibson, Hasbro marketing director Greg Lombardo, ILM animator Charles Alleneck, production designer Jeff Mann, Hasbro VP of Boys Design Samantha Lomow, and visual effects supervisor John Frazier. “Robots” looks at the original toys and some of their characteristics, 1980s cartoon adaptations and the continued popularity of the Transformers, dealing with the fans, designing the Transformers, creating them, and voice casting/performances. The show offers fine details about the toys and their adaptation for the film. I particularly like the glimpse of how Megatron would’ve sounded if Frank Welker – who was originally cast in the role – had played the part. After this we get the 20 minute Autobots Roll Out. It features Bay, Mann, Archer, Kurtzman, di Bonaventura, LaBeouf, Frazier, picture vehicle coordinator Steve Mann, transportation coordinator Randy Peters, visual effects supervisor Scott Farrar, special effects coordinator Jim Schwalm and Automotion Industries’ Tom Molloy. “Autobots” tells us about the cars chosen for the film and their use in it. I hate to sound like a broken record, but these featurettes are all excellent and “Autobots” offers another strong experience. Decepticons Strike fills 14 minutes and 34 seconds with info from Bay, Orci, Mann, Hodge, Humphries, Sinor, Archer, LaBeouf, Bryce, Bates, and KNB EFX shop supervisors Michael Deak and Wayne Toth. “Strike” acts as a “Rise” except it concentrates on the baddies. I like the info about working with the military – and their reluctance to allow their weapons to be used as villains. The show offers another useful piece. Finally, Inside the AllSpark goes for 16 minutes, 59 seconds with Bay, Farrar, Alleneck, Frazier, Bates, Mann, LaBeouf, Spielberg, Vahradian, digital production supervisor Jeff White, TD supervisor Hilmar Koch, animation supervisor Scott Benza, digital artist supervisor Ron Woodall, digital compositing supervisor Patrick Tubach, and associate visual effects supervisor Russell Earl. “Inside” focuses on effects work. We learn about CG character design and animation, animatics, and melding live action and visual effects. The concentration on technical elements makes “Inside” a little dry, but it still gives us plenty of cool notes about how the filmmakers brought the robots to life. More Than Meets the Eye completes DVD Two. From Script to Sand: The Skorponok Desert Attack lasts eight minutes, 53 seconds and provides statements from Bay, Kurtzman, Orci, Duhamel, Mann, Schwalm, Frazier, Bates, Farrar, Tubach, location scout Michael Burmeister, ILM production manager Peter Nicolai, and actor Zack Ward. This short piece gives us an overview of the elements used to create the Skorponok scene. It’s not one of the DVD’s best featurettes, but it’s reasonably informative. A few Easter Eggs appear here. For one, head to “Our World” and click down through the featurette options. After “Giant Robots”, you’ll get a new icon, so press enter to find a 21-second clip that shows a fake commercial for a Michael Bay Transformer toy. The second egg is on the “Their War” screen. Move left from “Inside the AllSpark” and press enter. You’ll see a two-minute and 34-second second piece that spotlights Bay’s cameo. One more egg can be found. Go to “More Than Meets the Eye”, click up from the first featurette and hit enter. This reveals a 78-second featurette called “Casting Mojo”. It offers a cute compilation of auditions from some dogs considered for the part. Of all summer 2007’s big-ticket movies, none let me down as much as Transformers. I thought it’d be an action-packed blast but instead it was messy, confused and downright boring. I can’t complain about this excellent DVD, though. It provides stellar picture and audio along with a lot of fine extras. If you liked the movie, you’ll be pleased with this terrific release. I can’t recommend it to others, though, as it’s simply not a good flick.